Thank you for taking the time to share your experience on partnering with 50 Floor for your flooring needs. We are aware of your flooring concerns and look forward to addressing your concerns further during your scheduled appointment for 02/28/18. 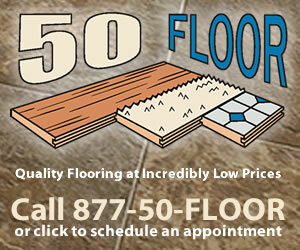 Thank you once again for partnering with 50 Floor for you flooring needs. Evidently a very poor grade of carpet was installed in my bedroom! There is already a path worn from the bedroom to the bathroom. This is a great disappointment! The carpet was installed in May, 2017, a short 10 months ago. The carpet looked very nice, and the gentlemen who did the installation were very congenial and thorough. Scraps were cut up and placed in the city pick-up area. Furniture was replaced as before. I really need a representative to visit my home and look at the extreme wear that has taken place in 10 months! As of today, I would not recommend 50 floor to anyone that I know because of the poor quality of the carpet installed and would express my extreme disappointment. I didn't like: Quality of carpet. Review #1194433 is a subjective opinion of User1194433.